Winemaker Sparky Marquis told reporters he was "gut-wrenched" that 462 cases of wine had been smashed while being loaded for export to the United States. "When they opened up the container they said it was like a murder scene," he said. "But it smelled phenomenal." 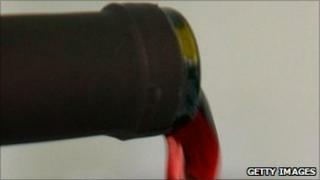 Mr Marquis told the AAP news agency the shipment represented one-third of his McLaren Vale winery's annual production. "It's a massive loss. We're going through all of the 462 cases at the moment just to see what we can save out of it." The wine was, however, fully insured. Agence France-Presse said Kerry Logistics, which was handling the shipment, moves more than 20,000 containers a year. Spokesman Brett McCarthur said the company had never had a malfunction of that type before. "It was very hard to make that call to Sparky," he said.